Where are you? 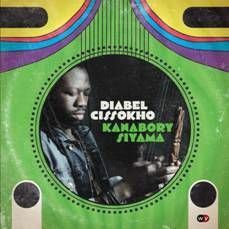 Home > News > Diabel Cissokho - UK Tour and New CD "Kanbory Siyama"
Singer, songwriter, kora player, multi-instrumentalist, producer Diabel Cissokho is part of the great line of Cissokho griots. Growing up in Dakar, surrounded by a rich musical heritage and a family of musicians, Diabel began playing a number of traditional instruments. However, Diabel’s affinity with the kora was clear from an early age. Diabel’s musical pedigree is exceptional. International tours with his family’s band Bannaya led to a long stint as Baaba Maal’s kora player, as well as with acclaimed musicians such as Kandia Kouyate, Pee Wee Ellis, Nuru Kane, Daby Balde, Omar Pene and Abdou Diop. Now well established in the UK, Diabel’s virtuosic talent, his “resonant voice and rocking kora style” (Songlines), have been welcomed everywhere from WOMAD and Glastonbury to London’s Barbican, where he performed alongside Femi Kuti, Cheikh Lo and Manu Dibango. Diabel’s success with bluesman Ramon Goose (resulting in the album "Mansana Blues") cemented his reputation as a versatile musician, able to effortlessly cross cultures. A 2010 European tour culminated in the DNA Culture Project with Ramon, Robert Plant guitarist Justin Adams, Gambian riti player Juldeh Camara and bassist Julian Joseph at Dakar’s renowned venue Just4You. “Nearly 30 years after first hearing the sounds of a kora, I found myself in Dakar for the first time last year, invited to the compound of the famous Griot family, the Cissokhos. In a sandy side street lit by bright sunlight was a band overflowing from the compound-drums of every shape and size, a whole kora section, balafons, ngonis and guitars plugged into a makeshift P.A., a beautifully dressed female backing chorus, and formidable lead singers with voices of poise and power. Another wave of humanity surging into the street was a dance troupe of teenage girls, whose gymnastic energy was propelled by explosions from the drummers. Diabel’s upcoming album marks a return to his roots. Recorded in the UK and Dakar and featuring members of his own family, the album draws on Diabel’s rich musical heritage, blending beautiful Mandinkan melodies with an upbeat West African groove.